The University of Toledo Medical Center is continuing its transition away from paper records with the recent installation of two systems designed to improve efficiency between clinicians, enhance patient safety, and reduce anxiety among patients’ families and loved ones. In late March, a patient tracker system went live at UTMC designed to keep patients’ families informed of progress during surgeries in the operating room and the George Isaac Minimally Invasive Surgery Center. Large, flat-screen monitors have been installed in waiting rooms to list patients using a unique, confidential identifier. Families are given that identification number and can follow a patient on the screen to see if he or she is in pre-op, in surgery or in recovery, said Ed Hall, administrator of surgical services in the OR. “It’s too soon to know any official feedback as patient satisfaction surveys take some time to come in, but we’ve had tremendously positive feedback from families who have said just knowing more information about what is going on relieves a great deal of the anxiety that naturally comes when a loved one is undergoing an operation,” Hall said. According to Hall, as important as the tracker boards are for families, a similar series of flat-screen monitors detailing patient information for clinicians in the OR has improved patient care. In the last month, UTMC also has rolled out a new Radiology Information System (Ris) to complement the Picture Archiving and Communications System (PACS), which the Digital Campus Project brought online several years ago. Built by General Electric, Ris enables UT radiologists to take the X-ray, MRI, CT or other digital image scans provided by PACS and wrap additional patient information into a single medical record. “From the initial order for a scan from the primary physican, through scheduling the test and delivering the results back to the primary physican, this system has dramatically reduced our turnaround time,” said Dr. Terrence Lewis, assistant professor of radiology, who helped with the system’s installation and implementation. According to Shirley Neese, diagnostic and clerical manager in the Department of Radiology, the turnaround time to get a report back to the requesting physician after the scan has been completed has dropped from about 24 hours down to nine. “And we’re still working to see how we can improve the workflow process to drop that nine hours even lower,” she said. Lewis said the new process reduces the chances for errors or mixing up charts with the wrong patient. Also, radiologists are able to dictate directly into the system using voice-to-text technology that saves time. “We’re not sending dictation away to be transcribed and sent back to us anymore and for radiologists evaluating 80 to 100 scans of images a day, that saved time adds up quickly,” he said. Lewis said the system is also a great teaching tool for medical students and residents, enabling physicians to evaluate students’ work, make any corrections or needed changes, and send the report on to the primary physician. And, Lewis said, there will always be cases from time to time where lives can be saved as doctors get reports back more quickly and adjust treatment more rapidly based on a patient’s condition. In her recent book Letters to Jackie: Condolences From a Grieving Nation (New York: Ecco, 2010), historian Ellen Fitzpatrick published 250 letters from ordinary Americans written to Jackie Kennedy following the assassination in November 1963 of her husband, President John F. Kennedy. The letters in Fitzpatrick’s book were culled from thousands she discovered at the Kennedy Library in Boston. The letters detail in deeply personal ways how Americans from all walks of life were touched by the death of their young president. 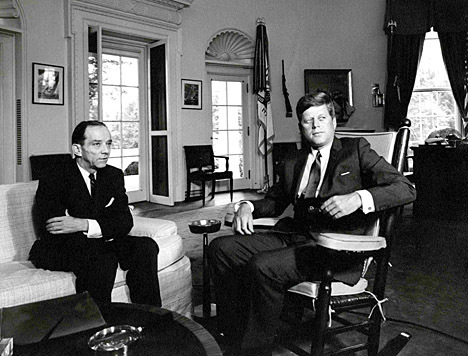 This photo of Foy Kohler, U.S. ambassador to the Soviet Union, and President John Kennedy in the Oval Office is part of Kohler’s papers housed in the Ward M. Canaday Center for Special Collections. Perhaps a more astonishing story of the impact of tragedy can be found in the papers of Foy D. Kohler that are housed in UT’s Ward M. Canaday Center for Special Collections. 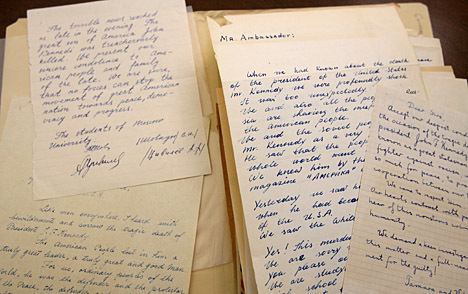 The collection contains more than 100 similar letters written in 1963 to Kohler, who was then serving as the United States ambassador to the Soviet Union. These letters were not from Americans, however, but rather were written by citizens of the Soviet Union. Coming at the height of the Cold War, just a year after the Cuban Missile Crisis when the United States and Russia had aimed nuclear warheads at each other, these letters show a surprisingly different side of the Soviet Union. Rather than a Cold War, they reveal the great warmth of the Soviet people and the profound sense of tragedy they felt on the death of America’s president. He was slain by a villain. Deserted is all the earth. Grief and pain are left. He stood for us, for Russians. The Canaday Center for Special Collections holds letters received by Foy Kohler following the assassination of President Kennedy. 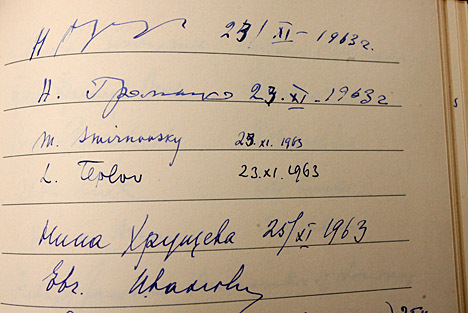 Soviet leader Nikita Khrushchev’s signature is on the top line of this condolence book that is among the papers of Foy Kohler housed in the Canaday Center for Special Collections. One letter even included a photograph of the writer’s two young children. In addition to providing insight into the thoughts of everyday Russians, Kohler’s papers also reveal the more formal side of the ambassador’s duties following such a shattering event. Included is a copy of the letter sent by Kohler to his counterpart, Andrei Gromyko, minister of foreign affairs, on Nov. 23 that officially conveyed the news of Kennedy’s death and the succession of Lyndon Johnson to power. The letter notes that beginning that day, the American embassy would recognize 30 days of mourning, and that a book of condolences would be available to leave messages of sympathy. Kohler’s papers include that book. It contains the signatures of most of the ambassadors from countries with embassies in Moscow. It also contains the signature of Soviet leader Nikita Khrushchev and several of his close associates. Foy Kohler remained in Moscow as ambassador through 1966. In his later career, he served as deputy undersecretary of state for political affairs, as a consultant to the Department of State, and a professor at the Center for Advanced International Studies at the University of Miami in Florida. His last position was a senior associate at the Advanced International Studies Institute in Washington, D.C.
Kohler died in Jupiter, Fla., in 1990. Because of the fondness he felt for The University of Toledo, which he attended from 1924 to 1927, he donated his papers to the Canaday Center. The collection of more than 90 linear feet of historical material documents all aspects of Kohler’s career, including that fateful day in November 1963. Floyd is director of the Ward M. Canaday Center for Special Collections. Theatre major Tyria Allen was cast in an episode of HBO’s “Hung,” which was shot earlier this month. She was selected from a pool of 70 people that included professional actors and students from master of fine arts and conservatory programs. Initially, representatives of Pound & Mooney Casting, a nationally renowned casting company in the Michigan area, contacted Cornel Gabara, UT assistant professor of theatre, and expressed interested in auditioning students for TV and film work being cast locally. 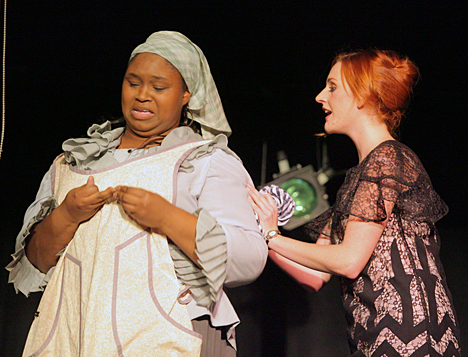 Tyria Allen, left, shown here with Betsy Yeary in the 2009 UT production of “Machinal,” will appear in an episode of HBO’s “Hung” this summer. This role is not Allen’s first on-camera experience. In addition to her course work, she has acted in a number of local TV commercials. Still, she was amazed at the difference in intensity. “I knew that when filming a show, the director will call for the scene to be shot from multiple angles. But they do many more than you would think they do,” she said. While excited about her first major acting job, Allen is tight-lipped about the nature of the episode and her role. She said she doesn’t want to spoil it for fans of the show. She will appear in episode No. 202, which is slated to air sometime in July during the summer ratings period. Whether her role becomes recurring or not, this opportunity marks a turning point for Allen’s career as an actress. A national talent agency, the Talent Shop, learned of her role and sought her out to represent her and expressed an interest in representing her in the future. As a result, she is eligible to join the Screen Actor’s Guild and has embarked upon her professional career while still a student. Irene Alby, UT associate lecturer in theatre, who has taught Allen and also directed her in several plays at the University, said, “This is a significant achievement for us and our students because it shows the versatility of our students. Although our main focus is on classical acting, we have demonstrated that our actors are well-trained enough to get cast in highly competitive jobs in both theatre and TV/film. Talented students have been building the UT Department of Theatre and Film’s reputation. Last summer, three students netted major internships. Film major Meg Sciarini was accepted to the 2009 Creative Minds in Cannes Film Program and interned in Cannes, France; film major Branden Cobb interned with MTV’s New York promotion department and appeared in an MTV online ad; and theatre major Jason Santel interned with Samuel Goldwyn Films in Los Angeles, where he reviewed scripts and independent films. Dr. Rosemary Haggett, right, posed for a photo with Outstanding Women Award recipient Sharon Periat. Two UT employees were honored last week for their exceptional contributions to the campus community at the 24th annual Outstanding Women’s Awards ceremony. The University Women’s Commission sponsored the program, which was held in the Savage Arena Joe Grogan Room Thursday. 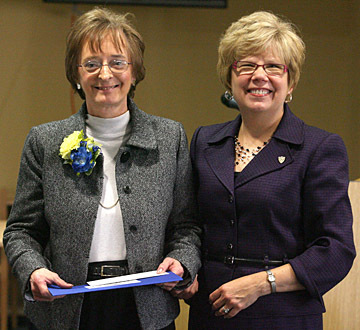 Dr. Rosemary Haggett, Main Campus provost and executive vice president for academic affairs, handed out awards. Receiving Outstanding Women Awards were Sharon Periat, interim director of student services in the College of Health Science and Human Service, and Vandra Robinson, curriculum systems analyst in the Registrar’s Office. Periat started working at the University in the late 1980s at the former Community and Technical College as a placement-testing monitor. She then became a part-time adviser to those seeking associate degrees. Periat came to Main Campus when the College of Health Science and Human Service was formed. 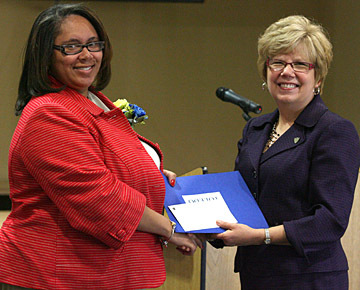 Dr. Rosemary Haggett, right, presented an Outstanding Women Award to Vandra Robinson. Robinson joined the UT staff in 2005 as an academic coordinator in the Department of Civil Engineering. 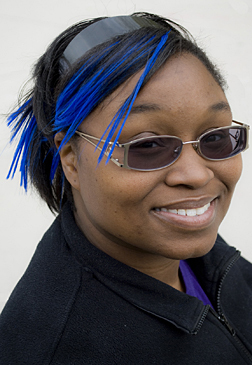 She moved to the Registrar’s Office in 2008. She is working on a doctorate in higher education at the University, from which she received a bachelor of arts degree in 1998. 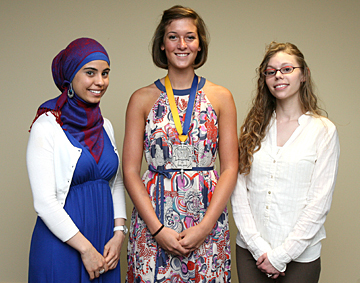 Students who received scholarships were, from left, Linda Amrou, Nicole Beck and Angel Marie Ellison, and, not shown, Paulette Bongratz. • Angel Marie Ellison, a senior majoring in early childhood education. The future of health-care education will be on display Thursday when The University of Toledo hosts a Simulation Fair. The event, from 10 a.m. to 6 p.m. April 22 in Collier Building Room 0202 on Health Science Campus, will celebrate the University’s new Interprofessional Immersive Simulation Center and the latest in simulation technology to train tomorrow’s health-care professionals. A ribbon-cutting ceremony is scheduled for 3:30 p.m. for the center’s newly dedicated 12,000-square-foot space in the Collier Building, and demonstrations of state-of-the-art simulation models will be at 12:15 p.m. and 4:15 p.m. Practicing health-care professionals also will be able to use the center to hone their skills, Boyers said. The new space for the Interprofessional Immersive Simulation Center will expand the collaborative and interdisciplinary education and research already under way, Boyers said. Ultimately, the goal is to have a dedicated space twice this size that will include the more extensive immersion simulation options available and also allow additional opportunities for the University to partner with industry. The University already has begun growing its simulation technology, and three new patient simulators will be welcomed to campus at the Simulation Fair. These patient simulators breathe, cry, speak, react to drugs and more so students can learn and practice both procedures and communication skills. Advanced tools the University hopes to add in the future also will be on display at the event, such as a CAD wall, which is a three-dimensional projection model that uses real patient scans that can be magnified to the cellular level and rotated for in-depth analysis. The field of simulation also has advanced recently to include a Computer Automated Virtual Environment, or CAVE, that can put people in a four- or six-sided room that depicts a virtual environment, such as an operating room, for safe practice of almost any situation. It’s unclear who is the voice of authority for Islam. In the past, it was much easier to have clear leaders in societies where literacy is limited, because those who could read where those who interpreted the texts. But as more learned to read, the proliferation of books, the breakdown of traditional authority, and most recently with individuals and the media offering up spokesmen for the religion, it has become convoluted, said Dr. Sherman Jackson, professor of Arabic and Islamic studies in the University of Michigan’s Department of Near Eastern Studies. “Religious authority has been so broken down that many don’t know who speaks for Islam,” he said. Jackson will discuss this issue during the annual Jewish-Christian-Muslim Dialogue. 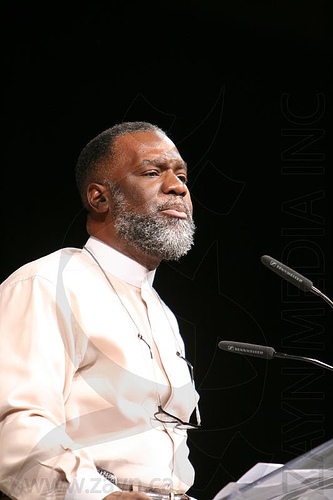 His lecture, “Who Speaks for a Religion: Questions of Religious Authority in Our Time,” will take place at 7 p.m. Thursday, April 22, in the Student Union Auditorium. So is the answer a person with formal religious training, or is authority given in a more informal way to someone with street credibility? Other religions have similar questions, Jackson said, particularly those that have to negotiate their relationship with state structures. As is the tradition of the annual Jewish-Christian-Muslim Dialogue, Jackson’s comments will be followed by those from the Jewish and Christian perspectives. Dr. Richard Gaillardetz, UT professor of Catholic studies, will discuss the Christian viewpoint, and Rabbi Moshe Saks, rabbi of Congregation B’nai Israel, will offer the Jewish perspective. A question-and-answer session will follow the speakers, and the evening will close with roundtable discussions that encourage inter-religious dialogue. The Jewish-Christian-Muslim Dialogue is the culminating event in the UT Initiative for Inter-Religious Understanding Series sponsored by the Program in Religious Studies in the Department of Philosophy. The University of Toledo Medical Center’s first outpatient center has begun using electronic medical records. The South Toledo Internists at the Glendale Medical Center went live Tuesday with the electronic system, Horizon Ambulatory Care by McKesson, that aims to provide more efficient and timely care for patients. It is the first conversion of the hospital’s more than 30 ambulatory, or outpatient, clinics that will go electronic as part of the University’s overall digital campus project. An ambulatory or electronic medical record is much more than taking a piece of paper and scanning it to create an electronic record, explained Hinch, who also is an assistant professor of internal medicine and pediatrics, and associate director of the internal medicine residency program. The electronic system uses templates to quickly and accurately input and update patient information, and it keeps all of a patient’s records in one place, no matter how many different specialists treat him or her, for a comprehensive record of treatments and prescriptions, Hinch said. The system includes several helpful components when it comes to prescriptions because the system not only automatically updates the medication list when prescriptions are ordered, but checks for allergies and interactions as well as insurance and Medicaid or Medicare coverage for the medication. There are similar checks for labs and other procedures, Hinch said. With the Horizon Ambulatory Care system and access to the existing Picture Archiving and Communications System that stores X-rays and CT and MRI scans, physicians have patient information available with a mouse click. Electronic medical records also allow for faster lab results than the current system that requires faxing results, sorting the mounds of paperwork, and then getting them in the hands of physicians, Hinch said. More clinics are scheduled to convert from paper to electronic systems soon. Look for more updates on the Digital Campus project on myUT and UT Update. Dr. Rosemary Haggett, Main Campus provost and executive vice president for academic affairs, last week shared her impressions of Arizona State’s “A New American University” with members of the Board of Trustees Academic and Student Affairs Committee, saying the institution could provide a constructive model for transformative change at The University of Toledo. Haggett and a group of UT faculty and staff recently visited the campus to learn how Arizona State moved from the traditional department structure to transdisciplinary schools and faculties. Arizona State has seen enrollment and diversity of students grow, quality faculty members have flocked to the institution, rankings have improved, and research funding has increased. Arizona State’s format produces “creative disorder,” Haggett said, and might not be exactly what UT is looking for, but the message of organization based on outcomes and bold change is something the University could embrace. Arizona State has exchanged traditional departments for schools and created collaborative faculties that identify a challenge and bring people together to work on solutions both for the community and the globe. President Lloyd Jacobs said the Arizona State experiment is designed to break down barriers between disciplines and that is what should be the focus when UT looks to it as an example. Haggett and the UT representatives were directed by the board to visit other universities engaged with similar cross-disciplinary activity and report back to help UT identify an approach consistent with University goals, priorities and values. • An honorary degree for Dr. Sultan Ahmed Al Jaber, chief executive officer of the Abu Dhabi Future Energy Co., in recognition of his achievements in the support and promotion of renewable energy in the United Arab Emirates and globally. • Promotions and tenure for a total of 24 faculty members on Main Campus, 13 of whom were approved for tenure. There are still several pending. Jacobs commented that his interviews of the faculty members up for tenure were a pleasure, and the process was good for the institution. “These are astonishingly accomplished, committed, intelligent people,” Jacobs said. • The provosts’ recommendations for five new Distinguished University Professors. • A new College of Adult and Lifelong Learning that would begin in the fall to better address the needs of adult learners, which is a growing segment of college students. The committee also heard an update from Dr. Jeffrey P. Gold, Health Science Campus provost, executive vice president for health affairs and dean of the College of Medicine, on graduate medical education. And trustees and administrators discussed, but took no action on, the idea of a smoke-free campus, which has been an ongoing dialogue on campus with a student debate, petition drive and campus-wide vote on the issue. The current policy on Main Campus prohibits tobacco use indoors and restricts it outdoors to 30 feet from buildings. Several trustees expressed skepticism that a policy change on Main Campus was needed. The Health Science Campus is tobacco-free. On-campus residents recently were asked to complete a U.S. census form, and more than 98 percent of them returned the form to census workers earlier this month. According to Elaine Turner, associate director for administrative operations for the Office of Residence Life, 3,587 of the 3,646 students living on campus returned their completed census forms by April 1, the national deadline for returning the document. Dr. Shanda Gore, assistant vice president for equity and diversity and U.S. census liaison for UT, said the fantastic return rate was due to the hard work by residence hall staff. Gore added that because this year’s census will not include a margin of error in its results, a high return rate was more important than ever. The U.S. census is conducted every 10 years and is designed to produce an accurate count and location breakdown of the U.S. population. The data collected by census enumerators is used to apportion seats in the U.S. House of Representatives; determine how many Electoral College votes a state receives; and help federal and state governments and other organizations award research and grant funds. According to the U.S. Census Bureau, the data is used to determine where to send upwards of $400 billion in federal funding for schools, roads, hospitals and job training centers. Young home-schooled students will “Rocket Into Chemistry” with fun science experiments Saturday, April 17, at The University of Toledo. About 50 students will participate in science activities and experiments during the “Rocket Into Chemistry” event from 10 a.m. to noon in Bowman-Oddy Laboratories and Wolfe Hall. The students, ages 4 to 13 in kindergarten through sixth grade, will start their day with an “explosive” lecture and end with a sweet liquid nitrogen ice cream treat. Activities are planned throughout the morning to educate students on states of matter, gas laws, acids and bases, chromatography of food dyes, and polymers. Most will take place in Wolfe Hall Room 1201. Participating students are from the greater Toledo area and southeast Michigan. The UT chapter of the American Chemical Society Student Affiliates is sponsoring the event. Students from the group recently attended a national meeting of the American Chemical Society where they heard presentations about home-schooled students lacking opportunities to learn with hands-on experiments. Experiments might not be part of a home-school education for some students because of the costs and access to supplies or the laboratory science experience of parents, but that’s where this event can help, said Deitsch, a sophomore majoring in pharmacy. For more information, contact Deitsch at jacob.deitsch@rockets.utoledo.edu or 419.202.5184.